Flagstaff Altitudes – Page 55 – A photo blog about mountain biking, skiing, running, weather, astronomy, and more. Earlier this month it was apparent that there would be one final night of exceptionally clear skies before the summer monsoon pattern set up and skies would be cloudy more often than clear. I thought another night sky image with reflections of the stars in water might be interesting so I ended up at Lake Mary a few miles southeast of Flagstaff. 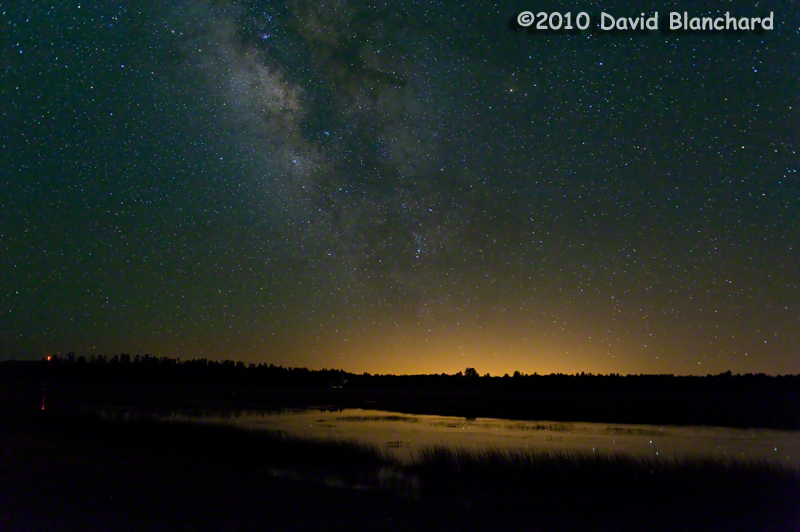 I was surprised to see how much light pollution there was in the southern sky. This stray light is coming from Phoenix, located over 100 miles to the south. There is so much light that it is even reflected in the lake — as are a few of the stars. A very short distance to the north of where this image was taken is the Anderson Mesa astronomical station. It’s hard to believe that they can still gather useful observations of the sky with this much light pollution. Finding truly dark skies is becoming a global challenge. The summer rainy season is now in full swing across the southwest and the skies are cloudy most of the time. I’m no longer able to shoot images of the stars, planets, moon, or other celestial bodies. I’ve turned my attention to the daily thunderstorms that pop up across northern Arizona during this period. I’ve been trying to capture daytime lighting photos for many years. The old way was to set the camera on a tripod, point it at an active storm, and attach the shutter cable release. Then I would hold the release with my thumb on the trigger and when I saw the first flicker of lighting I would push the release. A fairly crude method but it does work since the duration of a lightning flash, though short, is often long enough if you have fast reflexes. Nowadays, though, photographers can build or purchase an electronic lightning trigger that does essentially the same thing but is much faster and more reliable. Here’s a photo taken a few days ago in Kendrick Park in northern Arizona as a thunderstorm moved across the cinder cones of the San Francisco Volcanic Field. Taken with a 28-mm wide angle, the image has been cropped to highlight the lightning flash. 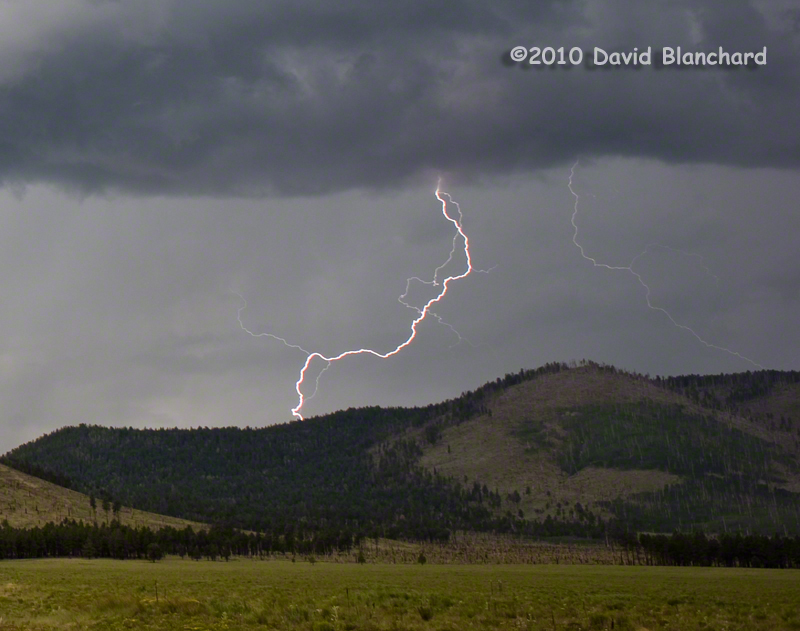 Cloud-to-ground lightning over northern Arizona showing the upward return stroke. 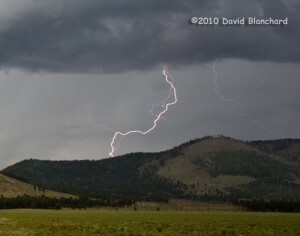 The downside of capturing an image in this manner is that the initial stages of the lightning flash are not captured since it is this phase of the lightning sequence that triggers the lightning device. 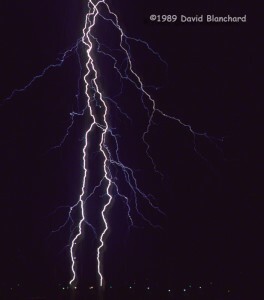 This early stage of a lightning flash is typically where all the branching and filaments occur. The bright part of the flash captured here is a return stroke that is mainly an upward transfer from the ground to cloud along a single channel. Compare the previous image with this nighttime image (scanned Kodachrome 64 slide) taken many years ago. In this image, I left the shutter open for an extended period of time (typically 10 to 30 seconds) before the flash and then closed the shutter immediately after the flash. This captured the downward traveling stepped leader and the multiple paths before the main upward stroke occured. 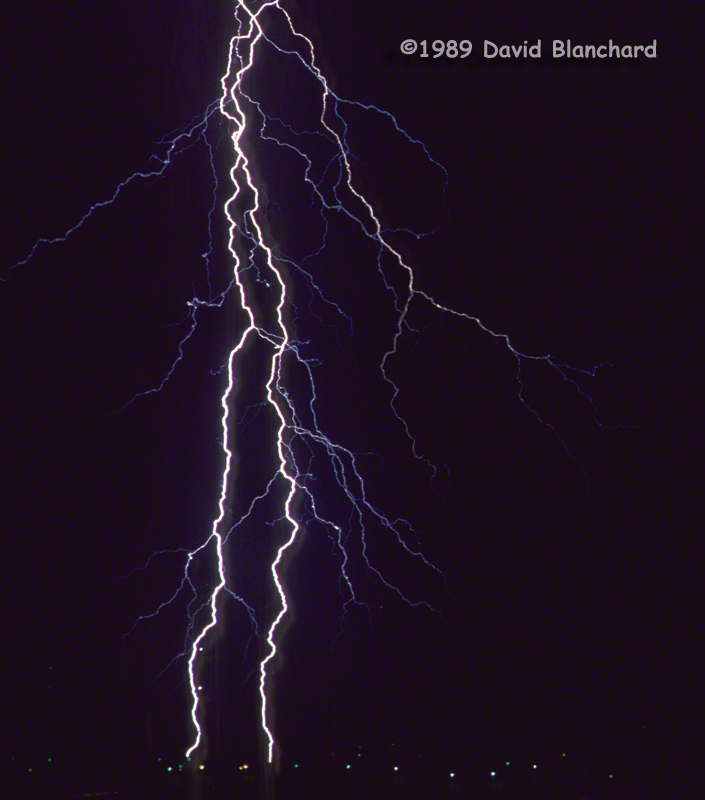 Cloud-to-ground lightning over eastern Colorado showing stepped leaders and multiple return strokes. It would be great if the modern lightning trigger devices could react to the first few microseconds of the stepped leader and trigger the camera shutter and capture the multiple paths and stepped leader. Perhaps such a device may one day be available. On a recent “First Friday Art Walk” in downtown Flagstaff, I had the opportunity to photograph two different dance troupes. The first performance (The Gypsy Chicks) was outdoors in the evening twilight on Heritage Square; the second performance (Troupe Shuvani) was indoors at the Flagstaff Photography Center. Outdoor performance of The Gypsy Chicks in Heritage Square during Flagstaff First Friday Art Walk. Performance of Troupe Shuvani at the Flagstaff Photography Center as part of Flagstaff First Friday Art Walk. I shot many images of both troupes but these two photographs stand out. And I think it is because the dancer is making “eye contact” with the camera. The dry weather and amazingly clear skies of early summer continue in northern Arizona. It won’t be too long before the rainy season begins and it will be cloudy more often than clear. Best to take advantage of the great conditions and grab a few more images of the night sky. 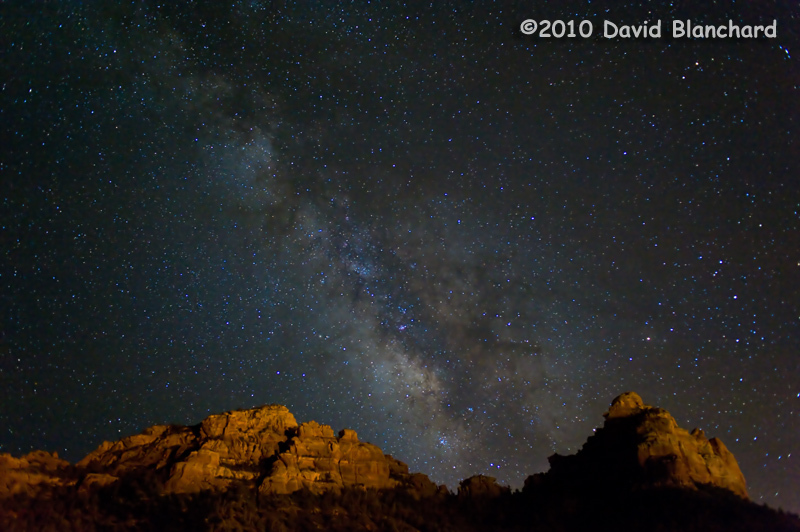 An important aspect of a night sky image is getting a good foreground in the composition so we took an evening trip down to Sedona hoping to include some of the famous red rocks in the images. There is no moon and it won’t rise until well after midnight. But there is enough stray light from the small city of Sedona, Arizona, to bring out a glow on the red rocks in this image. Milky Way Galaxy over the red rocks of Sedona, Arizona. In the past my only attempts at exposure bracketing were with a film camera and were limited to one or two additional images shot with minor variations in f-stop or shutter speed. Then, when developed, I would select the best image and put aside the others. All that has changed with digital. HDR image from Upper Waterholes Canyon in northern Arizona. Recently I had a chance to explore a slot canyon in northern Arizona. Typical of many slot canyons is the significant variation in light from very deep shadows to brilliant sunlit canyon walls. 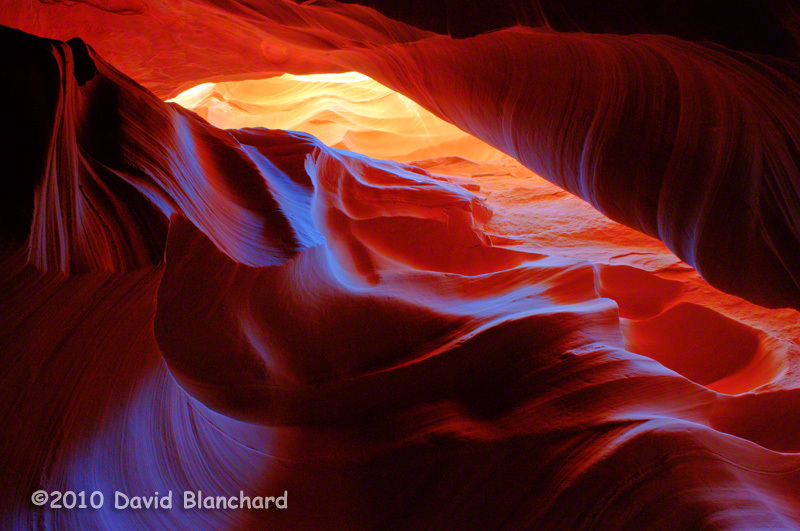 My best images in these slot canyon have always been compositions that minimize this large variation. But with automatic exposure bracketing and the many available software packages to process the images it was time to give HDR a try. With just a few images and using Photomatix HDR software I was able to bring out the subtle colors in the deep shadows of the lower canyon wall while capturing the more brilliant colors in the sunlit upper wall. 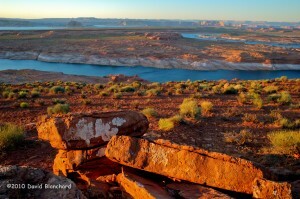 HDR image of Lake Powell at twilight. A second HDR image is able to capture both the well-lit areas and the shadows as twilight approaches over Lake Powell north of Page, Arizona.